The events in Japan could set back what progress has been made in recent years in the global nuclear power industry. The Russian nuclear community is concerned over the events in Japan. In official press interviews, they insist there is no reason to panic and that existing plans to boost export contracts are on track. In reality, however, they are seriously worried about the outlook for the peaceful use of nuclear power. The global nuclear energy industry could well fall victim to a new Chernobyl syndrome if the public believes that nuclear energy for peaceful means is too dangerous. Worries over the future of Russian export contracts are widespread among industry insiders. Rosatom’s official position, however, which it pitches to the press, is more than optimistic: No contracts will be terminated, there is no reason to panic and the nuclear energy industry is safe. Meanwhile, the global nuclear energy industry was still suffering the consequences of Chernobyl as recently as the early 2000s. That catastrophe affected not only Russian public opinion, but also the sentiment of the international community. Under negative public pressure, construction of new nuclear power plants in North America and Western Europe was discontinued. Germany in particular decided to scrap nuclear power altogether and gradually transition to thermal power plants and alternative energy sources. The transition should have been completed, according to the German government’s plans enacted in a corresponding law, within a decade. Japan wasn’t overly enthusiastic over nuclear power 15 years ago either. A protracted economic slump wasn’t encouraging nuclear construction, a situation exacerbated by growing public mistrust in nuclear technology. In the latter half of the 2000s, however, nuclear power showed signs of a revival. According to the first deputy director of the Nuclear Safety Institute, “the world entered a nuclear renaissance after nearly all leading countries realized that the issues of sustainable power supply, including environmental ones, can only be resolved through developing nuclear power.” Even Germany conceded that it was morally ready to revise its nuclear power ban. Russia and China also declared new ambitions. Five years ago, Rosatom chief Sergei Kirienko called for the construction of around 40 power units in Russia by 2030. President Dmitry Medvedev has included nuclear technology in his list of the most important modernization areas. China, in turn, has announced an unprecedented nuclear program, envisaging a seven-fold increase in nuclear power capacity by 2020. This translates into an annual launch of six or seven new power units over a decade. All these nuclear power plans, however, could now be shelved indefinitely once again, as some experts worry that the “Japanese Chernobyl” might turn public opinion against nuclear power. Opponents have yet more evidence that nuclear power safety cannot be guaranteed. 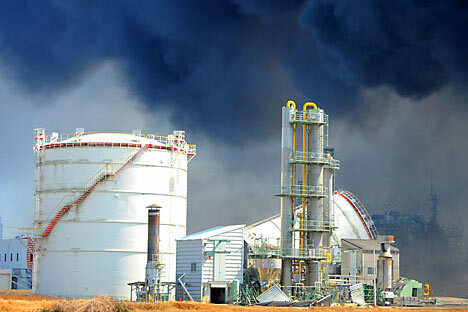 “The events in Japan clearly demonstrate that the nuclear power industry is especially vulnerable to natural disasters. And this totally debunks the myth the modern nuclear power industry’s reliability and safety,” said Vladimir Slivyak, co-chairman of the anti-nuclear Ekozaschita group. Russia has had its own brushes with nuclear catastrophe as a result of natural disasters: A 2000 power outage at the Sverdlovsk Region power grid cut off the electricity supply to the Mayak nuclear combine reactor, and power supply to the Kolskaya Nuclear Power Plant was cut as a result of gale winds. “We’ve been lucky so far, but for how much longer? Russia should learn a lesson from the Japanese events. And the lesson should be that nuclear power cannot be safe in principle, and new projects, such as a floating nuclear power plant in the Far East or ground plants in earthquake-prone areas only exacerbate risks inherent to the nuclear power industry,” said Slivyak. Nevertheless, Rosatom’s official stance is optimistic. Agency representative Sergei Novikov said that the power unit of the Fukushima No. 1 power plant that exploded was built 40 years ago by Americans. “Today’s nuclear power units are built worldwide according to a totally different design. Among other things, they are equipped with passive safeguards,” Novikov said. Russian nuclear experts are building five nuclear power units overseas, and another 10 or so such projects are very close to the beginning of implementation. Rosatom has a total portfolio of 30 orders for constructing power units in different countries. According to another source close to the Energy Ministry, the events in Japan will have no impact whatsoever on the implementation of Russian export projects scheduled through 2030. Some nuclear experts, however, admitted that events in Japan might change the situation in the global energy industry and worsen the outlook for Russian overseas nuclear power plant construction contracts. They consider the ostensible optimism of industry leaders as an attempt to mitigate potential criticism or even panic over nuclear power. This article has been abridged from the original version.